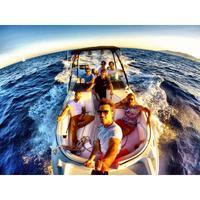 Find Tours, sightseeing tours, activities & things to do in Ibiza. Find discounted tickets, events, and many more. Explore the underwater beauty around Es Vedra island on this 6-hour private snorkeling cruise from Ibiza. With a private skipper and private powerboat all to yourself, cruise to Es Vedra, the rocky island off southwest Ibiza. Admire the craggy islet jutting out from the sea and snorkel over rock gardens awash with marine life. Relax on deck, enjoy the sea breeze and scenery, and bring aboard your own food and drinks to make your trip complete. Make like a VIP on a round-trip private cruise to the island of Formentera. Board your luxury yacht with a private skipper in Ibiza and enjoy a blissful day at sea with your friends or family. Sip on Champagne as you cruise over the waves, and anchor at white sand coves. Swim or snorkel in the turquoise sea; sunbathe to sounds from the music system; enjoy food and drinks that you’ve brought aboard, or go ashore to eat before your return to Ibiza. Experience a beautiful Balearics sunset from a private boat on this 5-hour evening cruise from Ibiza. Ride the waves to and from Espalmador, an uninhabited islet known for its spectacular sunsets. Bring your own food and drinks or purchase drinks from the onboard bar, and watch the sun set when the anchor is dropped in Espalmador bay. Admire the views and sea breeze, and get into party mode with tunes from the sound system. Discover the beauty of Ibiza town and surroundings in an exhilarating way ' on a scooter! With this scooter rental, set your own itinerary, drive along Ibiza's Mediterranean coast and see famous landmarks of the UNESCO World Heritage-listed city of Ibiza. Visit Ibiza's old town, Dalt Vila and more. An adventurous and convenient alternative to traditional tours, an easy-to-ride scooter allows you to get off the beaten path and explore Ibiza at your own pace, with the warm breeze against your face. No experience is necessary! The smaller of our performance series, our Performance 1107 is compact, sleek and stylish. Her front and rear suneds ensure everyone can have fun in the sun whilst a double cabin and bathroom below provide comfort and privacy. Recently refited in 2015 she is a real head turner. Sail on a luxury private Lagoon catamaran from the Southern beaches of Ibiza to the Northern shores of Formentera Island, stopping by Espalmador islet. On board WIFI, Paddle board, Bluetooth Speakers, snorkelling gear, mineral water and soft drinks and of course... IBIZA! :-) Fuel, tax and captain is also included, no hidden fees!